Eppie Wietzes retained his title with some ease, winning five of the seven races. His closest rival was once again the consistent Horst Kroll who won at Harewood Acres in August and took three other second place finishes. The Formula B class was won by Craig Hill with three class wins from Peter Broeker who had led the rankings until missing the last two races. Brian Robertson won FB at two of the last three races in a Fred Opert Racing Brabham BT29 to finish sixth overall. 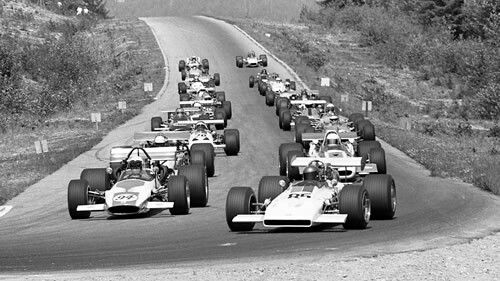 Only three competitive Formula A cars had appeared regularly so it was no great surprise that CASC decided to focus on Formula B for 1971. The The Gulf Canada Series for the Canadian Road Racing Championship was held over seven races and combined a 20-16-13-10-8-6-4-3-2-1 points system for overall positions with a 9-6-4-3-2-1 points system for class positions. Thus the overall race winner received 29pts (20 for overall win, 9 for the class win) and, for example, a Formula B car winning its class in third overall would receive 22 pts (13 plus 9). Results for this series have proved very difficult to complete, due in part to the poor coverage in Canadian magazines such as Track & Traffic . Wolfgang Klopfer has provided Autoweek reports, Don Markle uncovered much material in the CMHF Archives, Jim Ibey found what he could from Track & Traffic and Tom Johnston has provided scans of entry lists and reports from a variety of sources. Complete results have been found only for R2 Westwood 31 May 1970 (Autoweek), R3 Edmonton 14 Jun 1970 (Autoweek and also the official results) and R4 Rockcliffe 1 Jul 1970 (Autoweek and also the official results). The R5 Harewood 16 Aug 1970 results are derived from the Wheelspin report in the 27 May 1970 edition.